A non-alcoholic frozen sweet, tart drink made with fresh strawberries, fresh orange and lime juices, served in a beautiful wide rim glass rimmed with coarse sugar and decorated with a fresh strawberry. For this month’s virtual progressive dinner, I chose to bring the drinks. I’m pretty much a water drinker; I prefer to save my calories for dessert. However, one exception is when I’m eating at a Mexican restaurant. I have a hard time resisting a frozen virgin strawberry margarita. 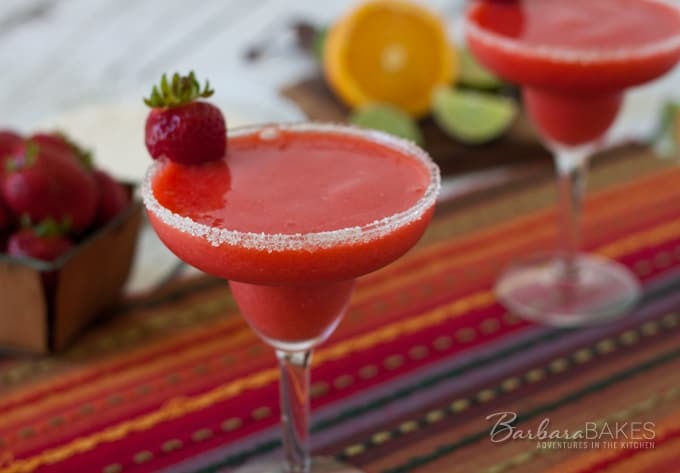 I don’t make strawberry margaritas at home very often, but they’re perfect with Tex-Mex, and when my kids were little they loved it when I made them. It was fun for them to have a fancy, grown up drink they could drink. Before you chop your strawberries, be sure and set aside 4 of the prettiest berries to garnish the glasses. I blended these margaritas a little more than planned, I like them a little more icy. You could also substitute frozen sliced strawberries if fresh aren’t available, then just dress up your glass with a slice of lime. Prepare the margarita glasses. Add coarse sugar to a shallow bowl. Wet the glass rims with a lime wedge and press the glass top in the sugar to coat the rim. Place the chopped strawberries, orange juice, lime juice and agave into a blender and pulse several times to blend. Taste and if necessary, add more agave. Add crushed ice and pulse until desired consistency is reached. Pour the drink into the prepared glasses. Garnish each drink with a fresh strawberry with the green leaves on top, slice them half through lengthwise from the bottom and place one on the rim of each glass right before serving. *For a non-virgin strawberry margarita add a splash of tequila and triple sec. Welcome to this month’s edition of Progressive Eats, our virtual version of a progressive dinner party. If you’re unfamiliar with the concept, a progressive dinner involves going from house to house, enjoying a different course at each location. With Progressive Eats, a theme is chosen each month, members share recipes suitable for a delicious meal or party, and you can hop from blog to blog to check them out. This month’s theme is Tex-Mex hosted by Milisa Armstrong of Miss in the Kitchen. We love Tex-Mex at our house. If you do too, please visit all of the Progressive Eats blogs to get all the Tex-Mex recipes. Wow these look insanely delicious and refreshing! I’m in the mood for TexMex now! The absolutely perfect beverage for a Tex-Mex menu! Ooooh yes please! I am so glad you are bringing these cool, sweet, delicious drinks to the party cause what makes a meal more like a party – and a Tex-Mex one at that – then frozen strawberry margaritas? Beautiful! Yummy ! This is perfect margarita for me since I don’t care for alcohol too much! Even my girls would love this as much as I do! Thanks Barbara! I would love this. Basically because I don’t like tequila all that much. 😉 I would much rather have a virgin margarita! Looks delicious. I can’t say no to a margarita, Barbara! I hope you won’t mind if I toss in a bit of tequila and Grand Marnier…? How fun that the whole family can enjoy these fancy drinks. Forget Shirley Temples. I’d have loved these as a kid! I don’t think I’ve had a strawberry margarita since I left the states nearly 20 years ago. Time to change that. That’s a beautiful photo – it certainly makes me thirsty! delicious! It looks refreshing and sweet but not overly sweet. YUM! Oh, yum!!! You’ve just made the celebration complete with these gorgeous margaritas!!! Perfect way to soothe my spicy tongue!! 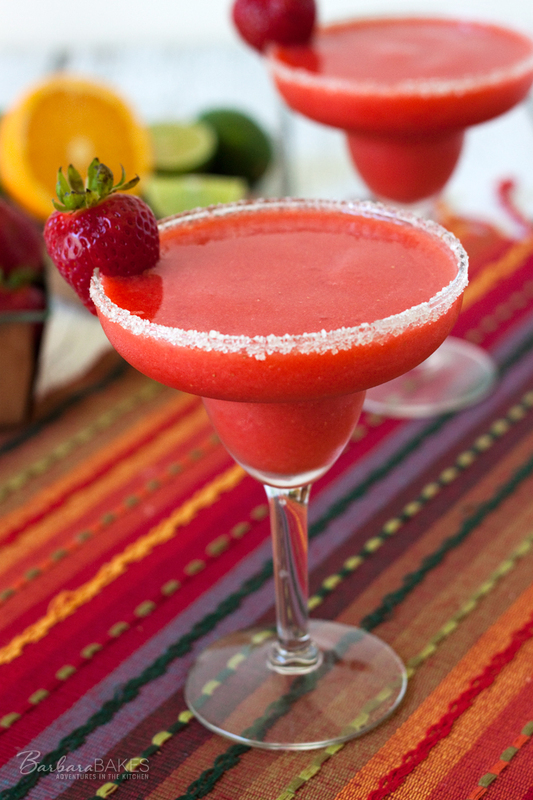 This is the perfect drink to enjoy with our Tex-Mex dinner! Love that it’s non-alcoholic so even my kids can enjoy it! Oh man – so refreshing!! This looks awesome!